Jackson, WY – Slow Food in the Tetons recognizes the power of film to educate and effect change through great storytelling . They are teaming up with award-winning filmmaker Jennifer Tennican to follow the critical first year of Jackson’s controversial, cutting-edge greenhouse, Vertical Harvest. This innovative business intends to provide year-round fresh produce and to employ individuals with disabilities. Slow Food in the Tetons works to grow the sustainable food economy in Jackson, Wyoming and the surrounding area by supporting producers, educating consumers and connecting them together in the spirit of good, clean and fair food. Hearts of Glass supports their mission by highlighting local food production and the relationships between producers and consumers. The film will also touch on the need for education around healthy, sustainable food choices and fair treatment of the individuals who grow our food. JenTen Production’s last two documentaries, The Stagecoach Bar: An American Crossroads and Far Afield: A Conservation Love Story, were about hyperlocal subjects, but resonated well beyond Jackson Hole and Wyoming. Both films were distributed nationally by American Public Television, with Wyoming PBS as the presenting station. We believe that Hearts of Glass will appeal to an even wider audience due to the current worldwide interest in local food production, sustainability and the disability rights movement. 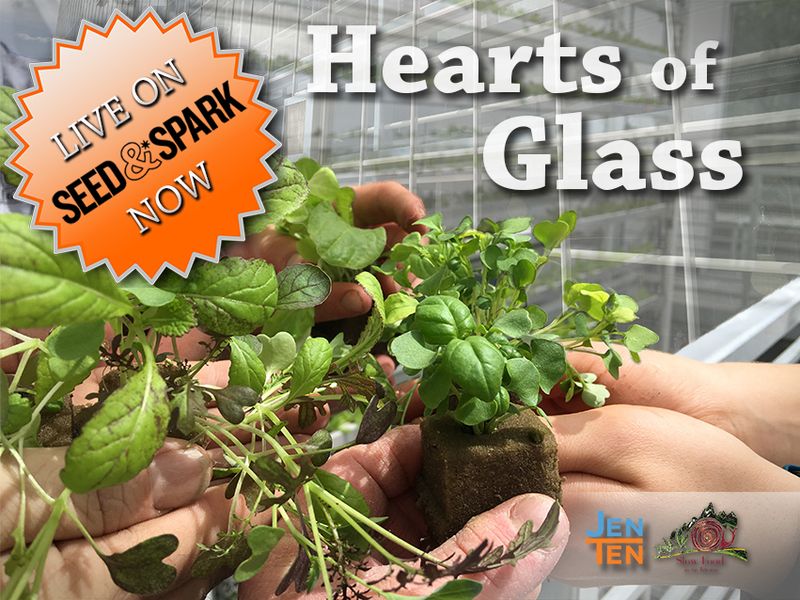 Slow Food in the Tetons and JenTen Productions are excited to announce a crowdfunding campaign for Hearts of Glass on Seed&Spark. Seed&Spark focuses exclusively on film projects. It’s a one-stop platform that allows filmmakers to find funding, audience and distribution. The timing of Hearts of Glass’ campaign is fortuitous because it puts Hearts of Glass in the running for additional funding and distribution through The Untold Story Crowdfunding Rally, a partnership between Seed&Spark and Project Greenlight Digital Studios. The rally is for feature documentaries in production whose focus is a story an audience has never seen before. Hearts of Glass needs to raise $20,000 (80% of the funding goal) and have at least 500 followers by the end of the 30-day campaign to be competitive in the crowdfunding rally. Followers can be financial supporters or those who sign up with their email to the campaign by clicking the follow button on the campaign page. In order to make it to the finals of the rally, Hearts of Glass has to be one of the top 10 most followed projects by July 1st, the rally’s end date. Scott Steen, Director of Operations of Slow Food in the Tetons, added, “This project will help us achieve our organization’s long term goals by raising awareness about local food options in our mountain town . It will encourage us to prioritize the role of good, clean and fair food as part of a sustainable community.” Donations to the film are tax-deductible through Slow Food in the Tetons. Hearts of Glass has received grant funding from the Wyoming Humanities Council and the Center of Wonder. Grant funding from the Wyoming Arts Council and the Wyoming Governor’s Council on Developmental Disabilities is pending. Business sponsors include First Interstate Bank, Prugh Real Estate, RE/MAX Obsidian Real Estate and Energy Conservation Works. In addition to grant monies and sponsorships, a core group of private donors has pledged their generous support, giving the project momentum as it enters this crowdfunding campaign.